Hello, how are you? I’m glad you’re here with us on our site, I like to see all of you satisfied with the standards that every day has here for you. In this subject we will leave for you another patchwork pattern that is a quilt block called Lone Star is probably one of the most recognizable quilt patterns for Americans so we have to learn how to do it. The Lone Star quilt block is probably one of the most recognizable quilt patterns for Americans. It is also one of the oldest patterns along with other models. It is a pattern well known for having several names. There are many variations of it with 6 points, or 8 points (the most common drawing) or even more. WHAT IS A LONE STAR? IT’S A GREAT STAR COVERING MOST OF THE TOP. The star has eight points and each section is made up of patched diamonds. Once the star is finished, large triangles and squares are sewn together, creating a large square top quilt. The star can also be applied on a large piece of background fabric. From here, some quilters like to add borders, while others add smaller stars to the background to fill in the blanks. THIS DESIGN IS TRULY EVERYTHING ABOUT COLOR. The overall appearance of the quilt can vary greatly due to the layout of the fabric. Often fabrics and colors are chosen to create movement. Radiating circles, starting from the center of the star and advancing towards the points, form when the tissues are placed in rings by the whole star. The use of cool and warm colors can draw attention in a specific direction, either in or out. If color is difficult for you, be sure to consult a color wheel for contrasting and complementary colors. DID YOU KNOW THIS IS A STAR OF MANY NAMES? In the mid-19th century, when it was created, it was called the Mathematical Star. The Native Americans called it the Morning Star, and it was highly characterized not only in its bedspreads, but also in clothing and various forms of art. Other common names are the Star of the East and Star of Bethlehem. It was nicknamed the Lone Star by quilters in Texas because it is the state of the solitary star. This pattern has a large star in the center and is composed of diamond-shaped fabric that forms the star’s points from the center. You should choose the colors for your Lone Star pattern and place them in a way that appears to be concentric circles radiating around the center. It is placed in the center of the top of the quilt and can be applied to the bottom or patched. 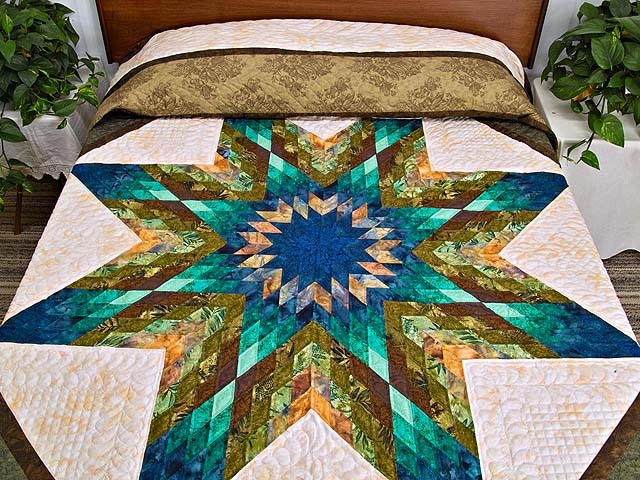 This same pattern of star when it is made in a smaller size, so that they cover the surface of the quilt, is known by other names such as burning stars, and when these points are touching, it is called stars. Pretty cool, huh, and nice to know the names. I hope you were impressed. Make beautiful quilts and enjoy the video tutorial.